Average kitchen size has increased over the last 50 years. While stories circulate of kitchens quintupling in average size during the last half-century, the increase is more modest: from about 70 to 150 square feet. How did this happen, and can we fine-tune these numbers? Looking at pictures of kitchens from the early- to mid-20th century, it is clear that people did not hang around in kitchens as much as we do today. Food was cooked, dishes washed, but no one sat around and did homework or watched TV in the kitchen. Several sources attempt to define the average size of kitchens today. One problem behind this confusion in numbers is that everyone has a vested interest in defining higher or lower numbers. The tiny house movement notwithstanding, large kitchens look great in home reality shows. They provide a larger canvas to conduct our lives (as well as occasionally cooking, too). Then you turn the page to discover that, in fact, kitchens are down-sizing because homeowners, enamored with the foodie culture, eat out more often. Kitchen designers and industry groups always want you to have larger kitchens because it means increased business for them. 70+ In 2009, the National Kitchen and Bathroom Association (NKBA) defined a small kitchen as being smaller than 70 square feet and a big kitchen as being larger than this. This is definitely at the very low end of the average kitchen size spectrum. 100 For the kitchen cabinet industry, the 10&apos; x 10&apos; kitchen is a standard benchmark for estimating kitchen remodel costs. 175 to 200 A more realistic look at the 10&apos; x 10&apos; kitchen includes a dining area, but this also begs the question: is dining space part of the kitchen or not? Where exactly does a kitchen end? This number comes from a study by Pi Consulting, a market research group. Pi Consulting mentions how the average kitchen size in the mid 20th century was about 80 square feet. 180 to 440 Average kitchen size allowance from home builder Toll Brothers. Note that this pertains to new-construction homes, not remodels. 720 Average kitchen size in 2012 as reported by The Home Company for a "typical" 4,800 sq. ft. home. In 2005, the average kitchen size was 480 sq. ft., according to the company. Giant, celebrity football field-sized kitchens attract all the attention in shelter magazines and remodel shows, but these skew the numbers and are still rare. Many of those in the home industry forget that most people do not live in million-dollar homes, as evidenced by the Wall Street Journal article "The Kitchen That Ate the House" which lists a "moderately priced" home as "priced between $600,000 and $1 million." From the last U.S. census (2010), the average home price was $272,900. According to the National Association of Realtors, the median price of a house in Q1 of 2016 was $217,600. According to the same U.S. census, U.S. homes size out at an average of 2,392 sq. ft. (up from 1,660 in 1973). If kitchens comprise 10% to 15% of the total living space, this would place average kitchen size at about 240 to 360 square feet. Taking into account smaller living spaces like condominiums and apartments, the average size of the kitchen is still on the low end: 100 to 200 square feet, depending on if you include dining space. The mid-range between those two numbers brings you to 150 square feet. 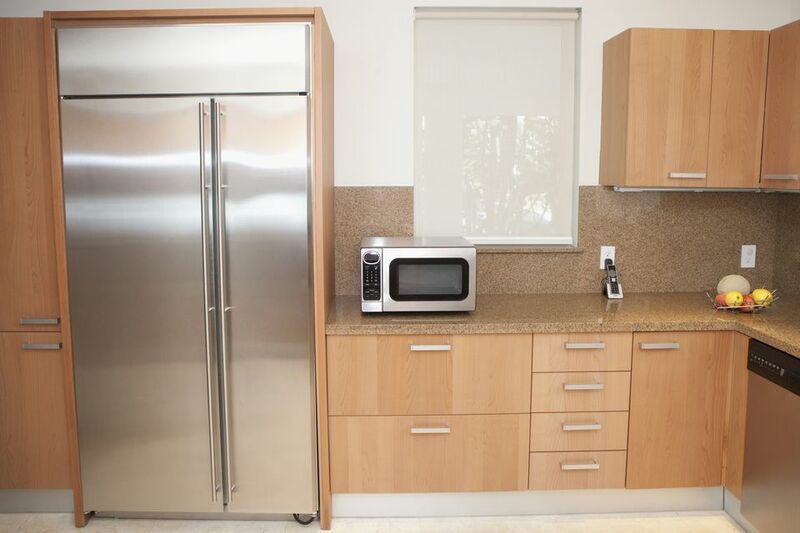 Essentially, this is the benchmark 10' x 10' kitchen with an overflow space of 50 sq. ft. for a dining area. Average kitchen size truly is subjective, and it is continually being redefined, usually in an upward direction. One-hundred square feet can minimally be called "average," with 175 to 200 square feet being a more realistic number. Should You Buy a Fridge With an External Water Dispenser? Why Is My Stainless Flatware Covered in Rust Spots?